On January 22nd the EU Commission launched its White Paper which lays out the major components of its energy and climate policy through to 2030. This is the first major step in what could well be a lengthy debate and parliamentary process before a new package of measures is finally agreed. The Commission has proposed a 40% EU wide greenhouse gas reduction target for the year 2030, an EU wide target of 27% renewable energy by the same year and a supply side mechanism to adjust the overall number of allowances in circulation within the EU ETS. The latter component is clear recognition by the Commission that the ETS has been awash in allowances for some time now and with a price of just a few Euros is doing nothing to drive emissions management across the EU. There are multiple reasons for the situation the ETS currently finds itself in, but one major contributor has been overall energy policy design in the EU. This has imposed renewable energy targets to the extent that further emission reductions under the ETS are not required once the former have been met. Hence the near zero CO2 price. There are two parts to this particular story – the first is the overall level of the renewable energy target and the second is the reality that transport (oil) and commercial / residential (natural gas) sectors hardly contribute to this, so it forces a much higher renewable energy penetration in the power sector, which is under the ETS. But with a 2030 reduction target of 40% and a new renewable energy goal of 27%, is the problem now remedied? This of course depends on how the renewable energy target is met. Importantly, it will not be imposed on Member States as it was in the period to 2020, but is only binding at EU level. This could mean that the Commission expects to be at 27% renewables based on the impact of policies such as the ETS, rather than requiring that Member States guarantee a certain level of renewable energy use and therefore effectively forcing them to enact policies to deliver such goals. But many Member States are likely to continue their support of renewable energy and may force it into the overall energy mix right through to 2030. 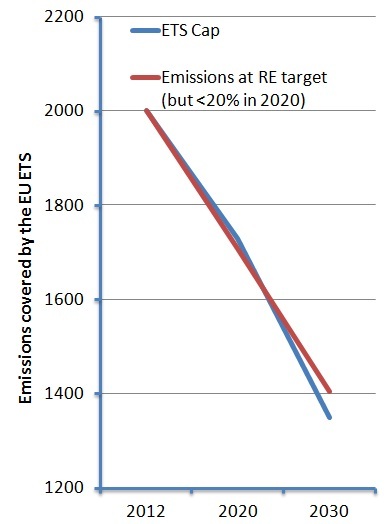 The worst case outcome for the ETS would be one that sees the whole 27% renewable energy goal met with explicit policies at Member State level. The chart below shows this – note that this is a simple model of the EU for illustrative purposes. Assume that at the end of 2012 EU power generation and industry sector emissions are at 2000 million tonnes CO2. By 2020, with a 1.74% annual reduction under the ETS, they need to be at ~1730 million tonnes. But with renewable energy being forced into the power generation system (although not quite reaching the 20% across the EU) and the EU easily meeting its overall 20% CO2 goal, sector emissions are below the ETS cap, which implies nothing else need be done, hence the low CO2 price. Projecting this out to 2030 with the proposed 2.2% annual reduction and meeting the 27% renewable energy goal across the EU energy system, shows that sector emissions are only slightly above the cap (about 50 million tonnes), which again implies a low to modest CO2 price. Assume further that a CCS programme is actually running and delivering 50 mtpa storage (through direct incentives) and no further action is required – so a zero CO2 price once again! The model also assumes about 30% growth in electricity generation from 2012 to 2030. This very simple model doesn’t account for the large allowance surplus that exists in 2012 (> 1 billion allowances), which would therefore be unlikely to vanish through normal growth in electricity demand, industrial production and so on. This makes it imperative that the EU also implements the supply side mechanism within the ETS, which would then remove much of the surplus through the early 2020s. Ideally, implementation of this should be immediate and also with immediate effect, rather than waiting until post 2020. Should Member States not implement specific renewable energy policies and the supply side mechanism is active and functioning, we might just have an ETS that actually drives change in the large emitters sector, but there are two big “ifs” here. Otherwise, expect continued price weakness and probably a higher overall cost of energy as a result.